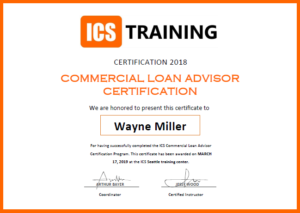 The ICS Commercial Loan Advisor Jump Start Training Program will provide you with the technical information, origination skills, tools, and resources you need to originate, structure, and fund commercial loans. The Commercial Loan Advisor Jump Start Training Program is straight to the point. Your focus will be learning the 5 core industry loan products, how to propose the proper product, and how to complete and submit a loan package to ICS for funding. Training covers the basics of commercial lending, loan programs available, terminology, how to originate loans, package loans, and submit them correctly for lender placement. You can complete the Online Commercial Loan Training Course and pass the exam in 4-10 hours or less. The ICS Business Development training section shows you exactly how to build, manage, and cultivate your business development region. We show you how to generate leads, and how to market to borrowers and referral partners efficiently. You will learn how to develop and market to your prospect list, find opportunities, and use key marketing tools and strategies to save yourself time. The Final Loan Advisor Exam is 200 questions, in addition to mutliple quizes you will complete along the way. You can take the final certification exam as many times as needed at no additional cost. The ICS online training program is straight and to the point. We show you exactly what to do and say. We provide you the information and direction you need to be successful in this business. Keep it Simple Daily - Just Do It! !